Will she find the last horses on earth? Serendipity lives inside a walled city. Before her mother died, she gave Seren an old figurine of a horse. Horses no longer exist in Serendipity’s world, but when she discovers a map that may lead her to real horses, she starts on a journey that will take her far from everything she knows. Traveling with an orphan boy, Tab, and his beloved dog, she's soon on the run from a powerful and dangerous man who will do anything to make sure Serendipity never leaves the walled city again. 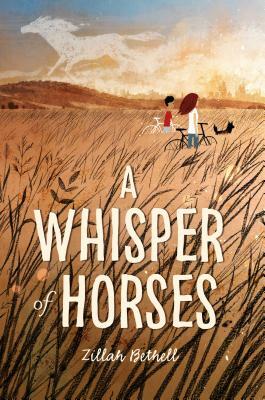 Zillah Bethell’s middle-grade fiction debut A Whisper of Horses is original, breathtaking, adventurous, and moving. It is a story of friendship, perseverance, and resilience that readers won’t soon forget. Zillah Bethell was born in a leprosy hospital in Papua New Guinea, spent her childhood barefoot playing in the jungle, and didn’t own a pair of shoes until she came to the United Kingdom when she was eight years old. She was educated at Oxford University and lives in Wales with her family. A Whisper of Horses is her first children’s book.